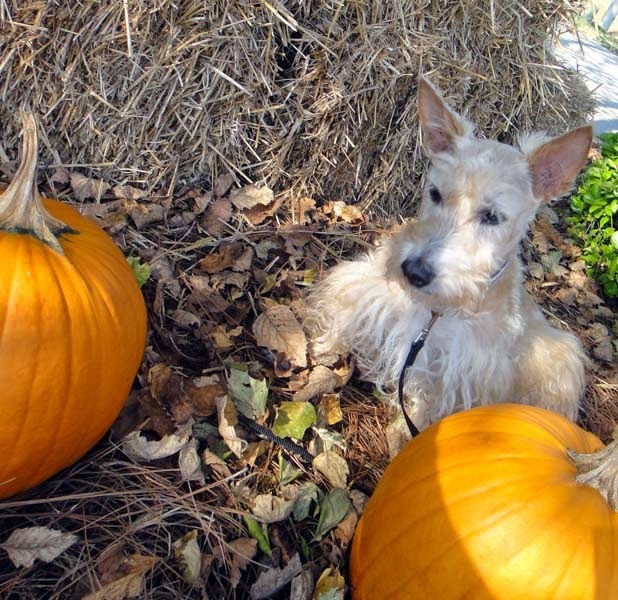 It's Wordless Wednesday, friends! That means we keep quiet while you tell us your deepest, darkest secrets. 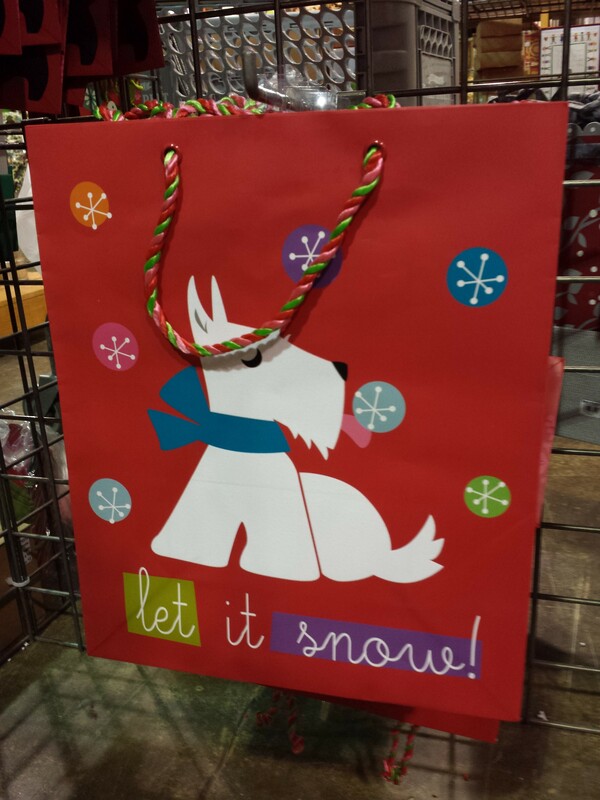 Ok, so we really don't expect you to reveal that much...unless you're trying to clear your doggie conscience before Santa Scottie comes around next month bearing gifts. How about you tell us something that makes you smile big like Mr. K here? Or, how about something you're especially thankful for this holiday season? 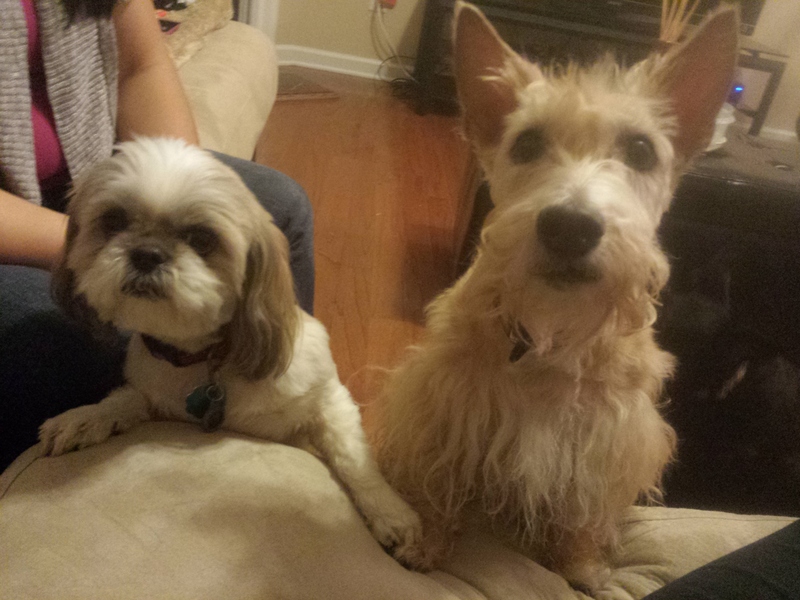 (Treats and table scraps, anyone?!) Happy Thanksgiving! 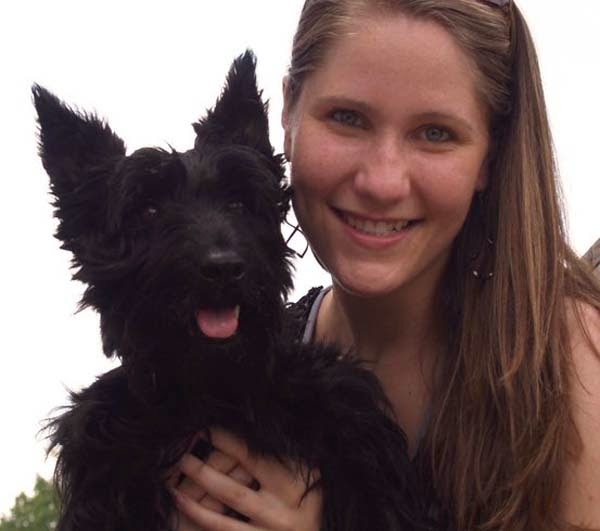 No, she isn't Katniss Everdeen but Heather Beather knows a thing or two about a different kind of hunger game: the kind where Scottie Mom sleeps in a few minutes later than scheduled on weekends and sets Heather on a scavenger hunt for nourishment. 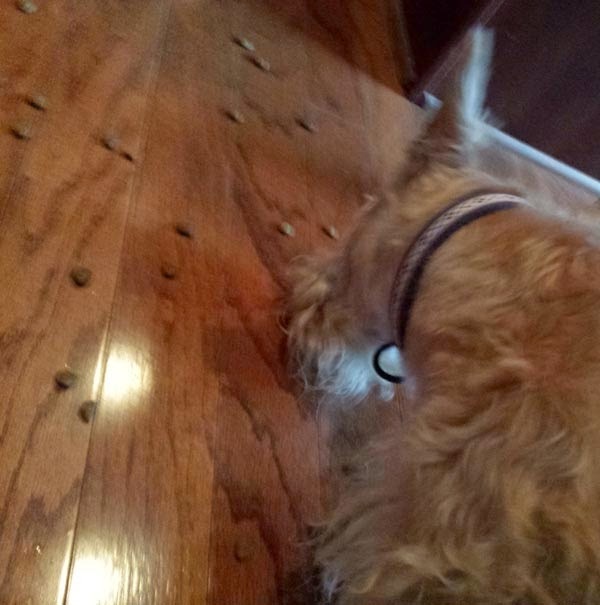 Nose pressed to the ground, Heather Beather searches every nook and cranny of The Scottie House, hoping to find a scrap of food here and there. She checks every door, hoping someone left one of the bathroom doors partially closed again so she can raid the trash bins and munch on some TP fresh off the roll. If that fails, she sits at the bottom of the stairs, contemplating whether or not to disturb the peace before deciding that the hunger in her belly really is catching fire and the situation needs to be addressed immediately. Up the stairs she goes. 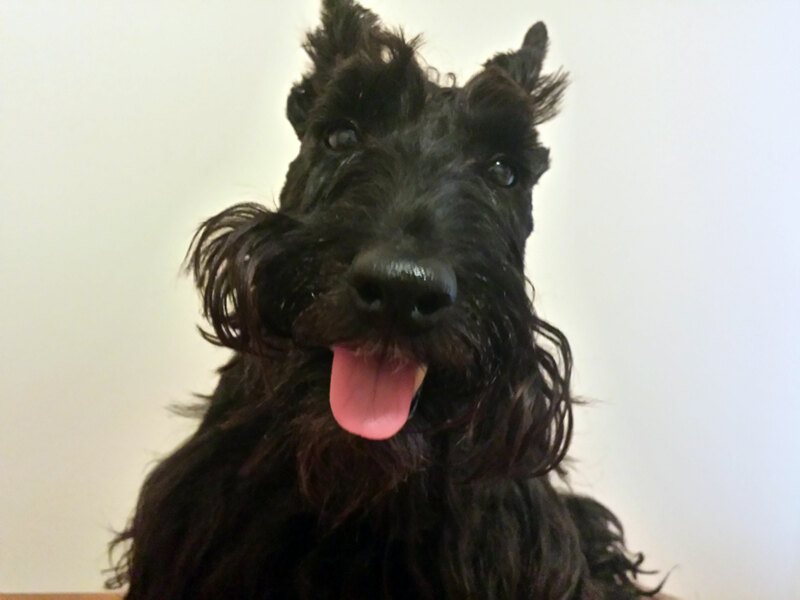 There's a soft clap, clap, clap of her Scottie claws touching the floor. Both bedroom doors are closed. She sits and waits. Surely, Scottie Mom heard her coming up the stairs. She sniffs under the door, making an effort to huff and puff a little louder than usual to wake Scottie Mom. No luck. She nudges the door with her snout. It doesn't budge. Heather Beather trots down the stairs to enlist the help of Mr. K, who's always up for some mischief. Time to start the hunger games, Heather says. Mr. K gets out of the Scottie bed, shakes off sleep and stretches his muscles. He lets out the battle cry, which sounds like a cross between a yawn and a half-woken 'ArRRroO," and follows Heather Beather to the stairs. Confident the battle cry awakened their hoomans, they wait at the foot of the stairs. But, much to their surprise, they don't come. 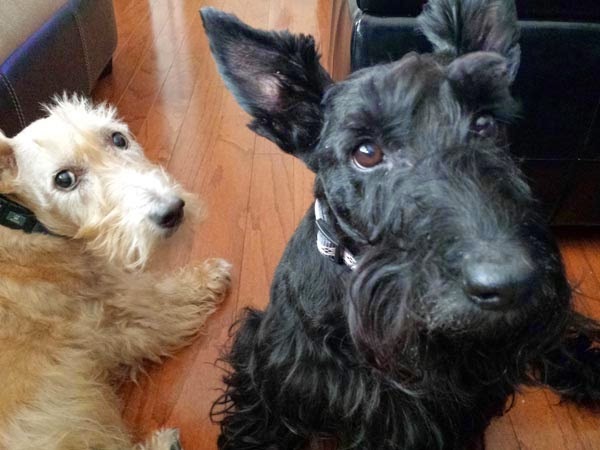 Outraged, the two Scotties plan their rebellion. Now, it isn't just one Scottie affected by hunger in the belly - it's two! Scottie Mom is now eight minutes behind schedule. Mr. K does a perimeter check, making sure Heather Beather didn't miss out on any opportunities to find grub. Nothing turns up. Together, they circle Scottie Island - the magical place in which the food is kept - like sharks. Each takes a turn trying their paw at the door. When that fails, they put their heads together and decide to race up the stairs - clap, clap, clapping their claws on the floor as loudly as they can. When they get to the door, Heather gives Mr. K the signal and he declares war on the sleeping hoomans: "Aaarf!" There's movement behind the door. The two Scotties get ready for battle. That door will open any moment. Who will they have to challenge? Scottie Mom or Scottie Dad? Or both! Footsteps are getting closer. Heather and Mr. K back up, ready to charge the door in protest of their mistreatment the minute it opens. The doorknob turns. Suddenly, Scottie Mom is there but instead of adding fuel to the rebellion's fire, she surrenders, falls to the floor to present kisses and asks Heather and Mr. K if they are ready to eat. Yes! Success at last. Heather and Mr. K nod and accept the peace offering before leading the way to the kitchen. After they feast, Mr. K asks Heather if they took the rebellion too far. Heather doesn't think so. 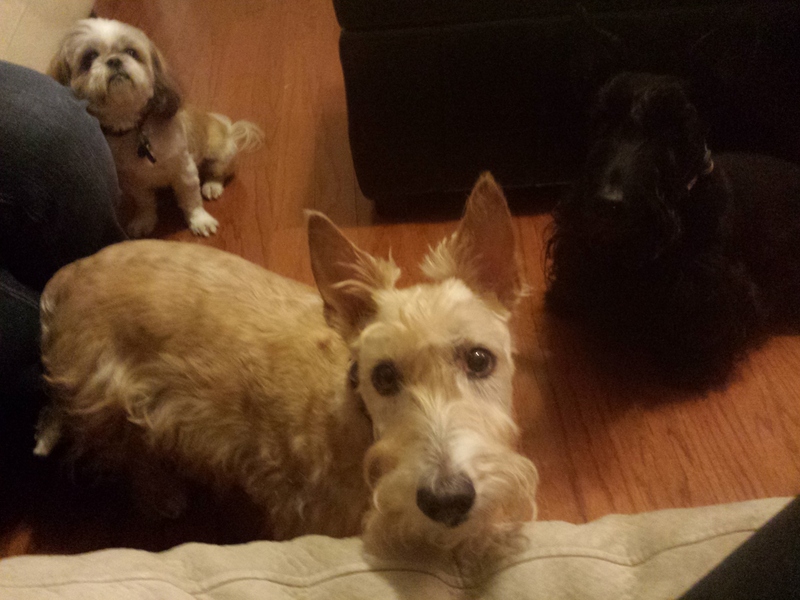 After all, it's no game when it comes to hungry, hungry Scotties. 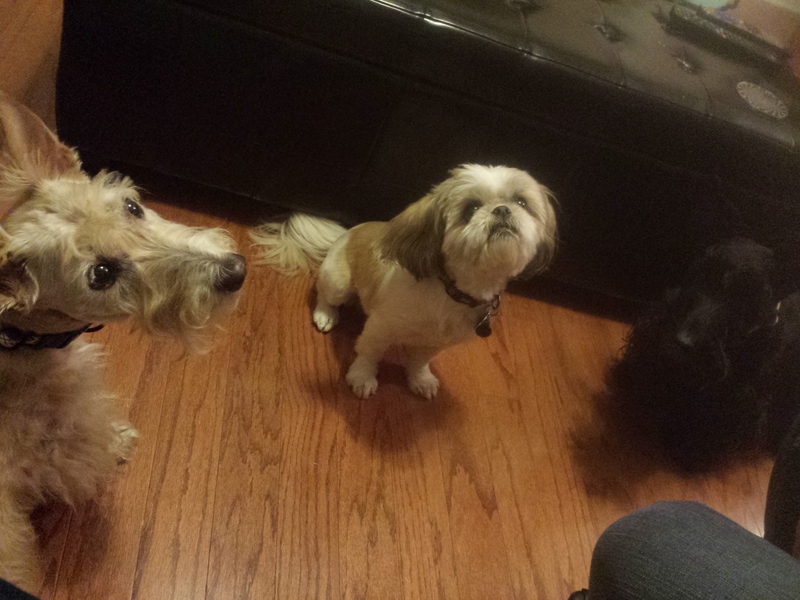 Our friend Lucky the Shih Tzu came over yesterday. 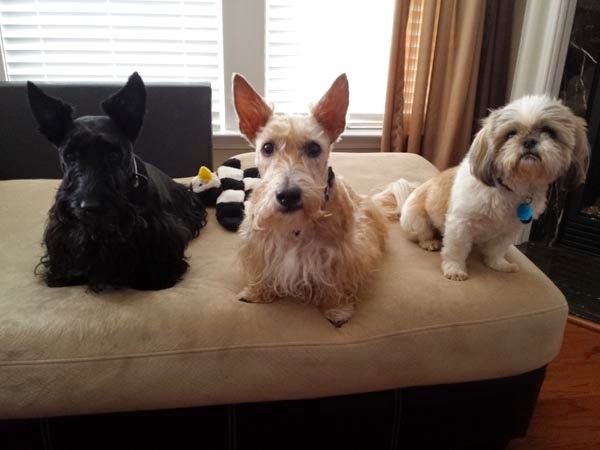 Here we are, the Three Dogateers ready for a day at play. ...and exchanged pee-mail (again and again - often in the same spots). 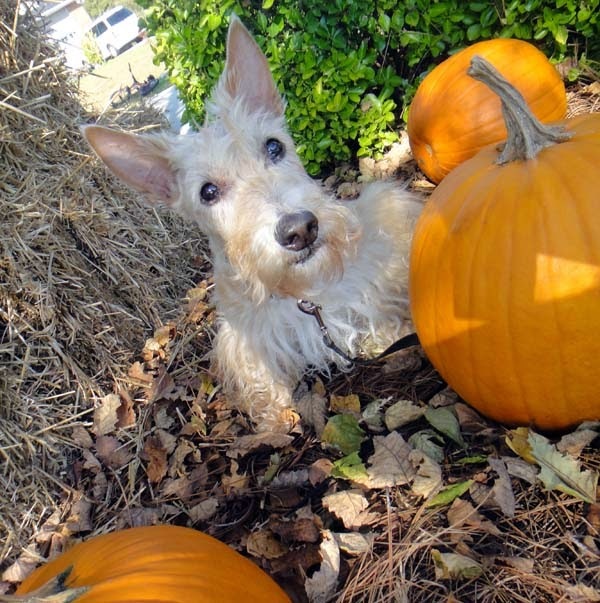 Lucky taught us his secret to scoring the best treats with this irresistible look. Then, we practiced "the look" on our moms. Treat, please? After a snack, we played hide and seek. 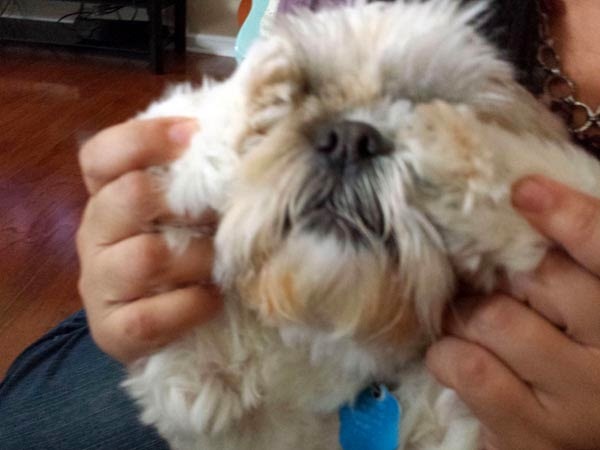 Heather and I hid while Lucky's Shih Tzu Mom made sure he didn't cheat. Sir Lucky explained that the best way to keep evil C-A-T-S at bay is to sport a rockin' hairdo that shows just how bad to the bone you are. 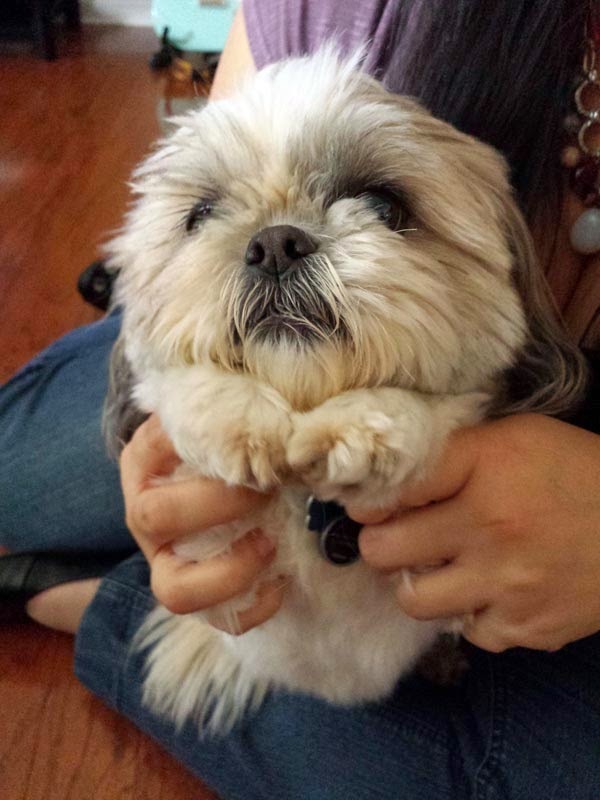 Lucky even offered to teach us his super powers of persuasion. 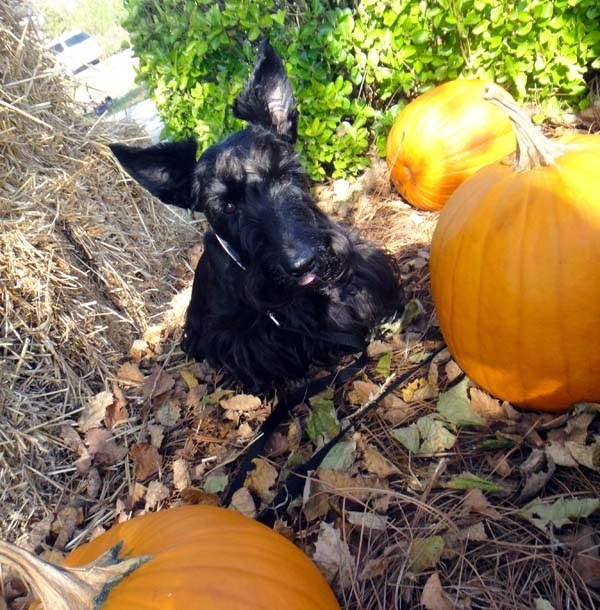 Our daring, little friend claimed he could get anyone to snuggle with him...including Scottie Dad. 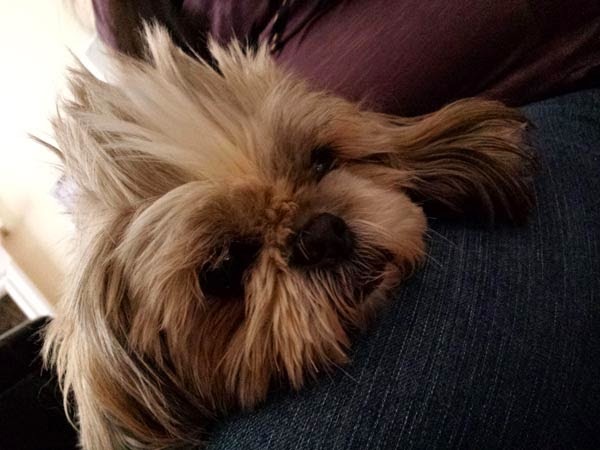 To our surprise, Lucky succeeded and earned the privilege of sitting on Scottie Dad's lap. 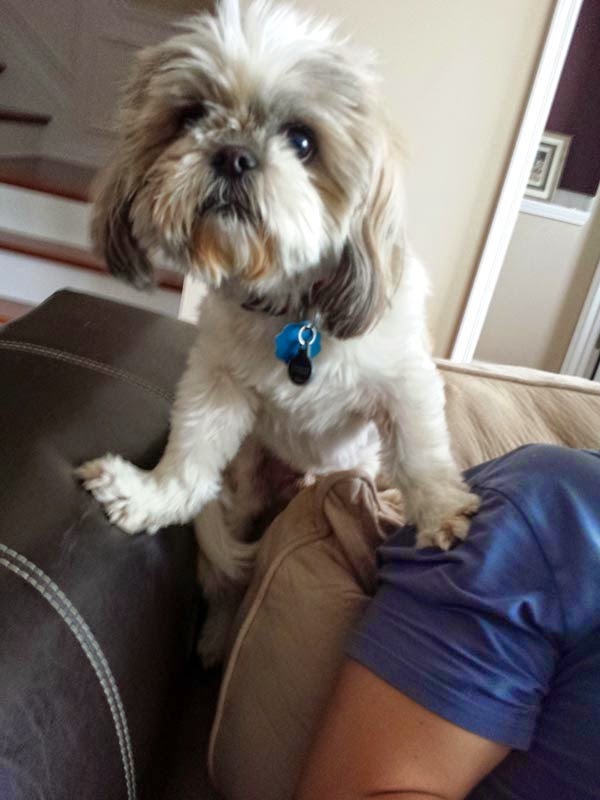 That's one smart Shih Tzu! It was then we realized something was very wrong with this picture. Scottie Dad, why is there a Shih Tzu on your lap? 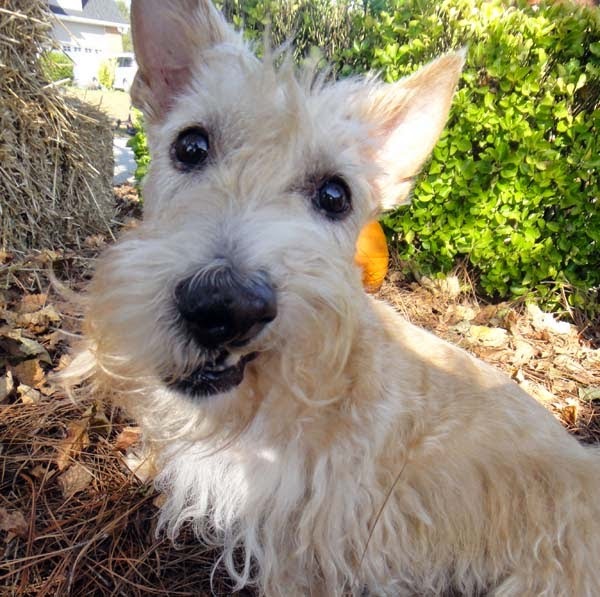 You still love us Scotties most...right? It is time to break out the sweaters and bundle up for those early morning and late night walks, friends! It is getting cold out there. And yet, the cold weather makes walks all-the-more exhilarating for Heather and Mr. K, who take off in bursts of energy as soon as their paws hit the ground outside. 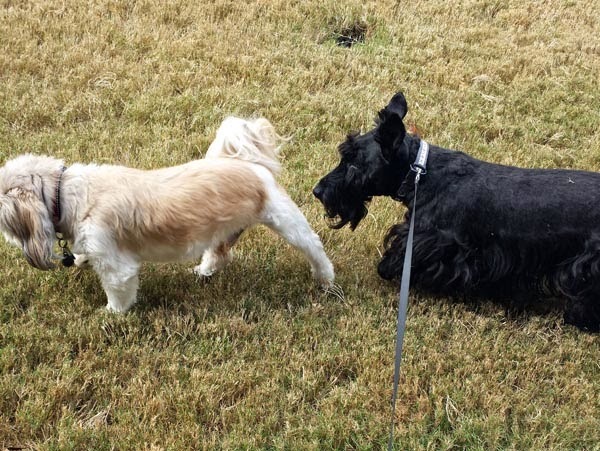 It is almost as if they are reenergized by every new (or not-so-new, since we've lived at The Scottie House for a few months now) surrounding they encounter. I think they've gone cold weather crazy! Our outdoors time in the cold goes a little something like this: Heather and Mr. K dash out the door, hurry down the stairs, take a few seconds to relieve themselves and then, we're off! Mr. K sniffs a rock. Then, he pees on it. As soon as he's done, he speeds off looking for his next target. Heather chases a leaf floating in the wind and stops to catch it. Then, she darts away from it as soon as she discovers (much to her disappointment, of course) that the floating leaf is not, after all, a treat dropped from the heavens just for her. Mr. K sniffs a bush. Then, he pees on it. And again, he darts away - dragging Scottie Mom with him...and so goes the cycle. After we make our rounds about the neighborhood in record time, Heather and Mr. K like to finish by doing a sort of "victory dance." Heather dives face first into the nearest patch of grass, scratching her chin on the frosted tips of green until she is sprawled out, lying flat on the ground and rolls around for a good back scratch. Mr. K takes note then decides to one-up Heather by attempting to dig himself a hole everywhere he turns before rolling around in the messiest spot he can find. By the time we reach the top of the stairs again, Heather is jumping up and down, beckoning me with nods of her head to open the door. And, if I'm not quick enough, she becomes much like a jumping jelly bean and winds up turning in circles. Mr. K, on the other hand, attempts to see if his nose will stick to the cold door, much like a child tries to see if his tongue will stick to ice. That Scottie nose does not move from the corner of the door until it opens and he can go inside. Still then, the cold weather crazy does not end. Mr. K gets a rather extended case of zoomies. He goes from the kitchen to the living room, up the stairs and under the bed, across the hall and under the other bed, again and again. Sometimes, he jumps up on the couch and tries to bury himself in the evil blanket that's been known to challenge him a time or two (Gasp!). Heather scoots across the floor as if trying to peel the layers of cold from her fur, making funny noises that sound like a cross between a sneeze and snort. Then, she stands up and shakes as if to say, "No more cold weather crazy!" It started with a trip to the store. 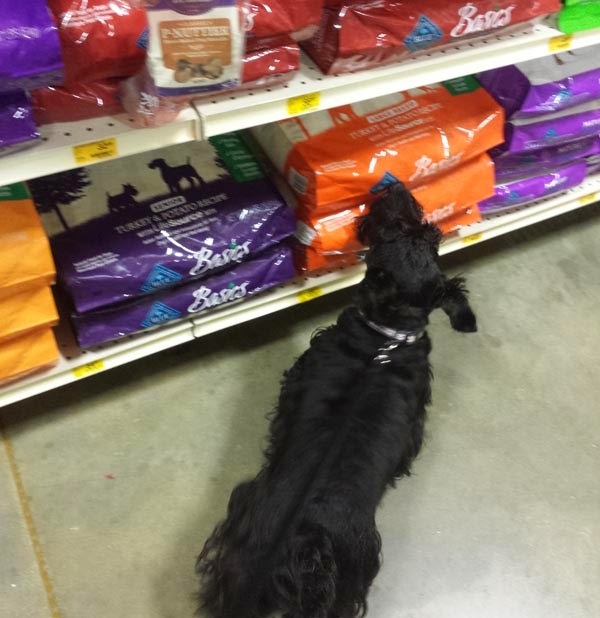 Scottie Mom let me sniff out all the options. 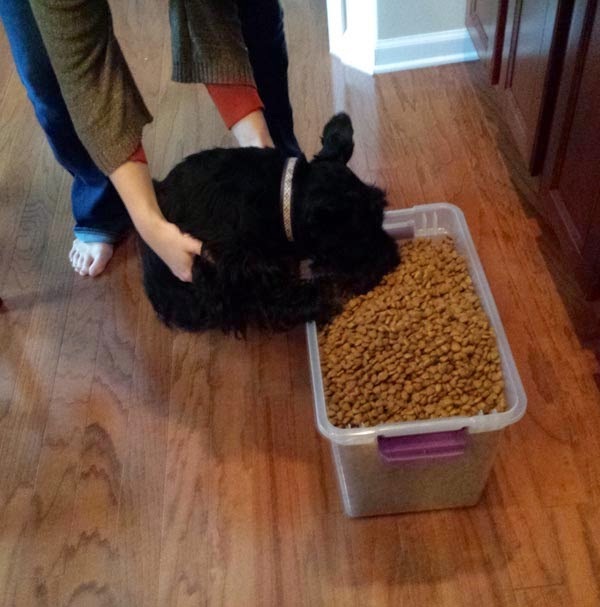 When we got home, Scottie Dad attempted to transfer the yummy stuff into a Scottie-proof bin. Needless to say, he failed (but we're okay with that!). No worries, Scottie Dad! We'll have this place cleaned up in no time. 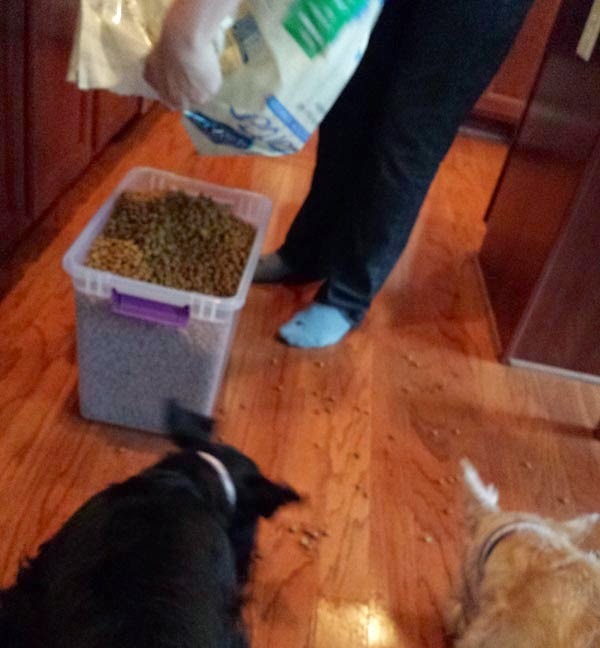 When all was clean, I decided I hadn't had enough so I helped myself to some of the good stuff that wasn't lost in the Great Kibble Spill. There we were, posing for photos when Mr. K double dog dared me to taste the big, orange treats. He said they were our reward for taking such cute photos. I thought about it for a minute. Something didn't seem quite right. These treats were much bigger than the ones we usually get. Surely, Scottie Mom wasn't going to let us eat them all! Ultimately, I couldn't pass up the double dog dare. What if I was missing out on a really great (and oversized) treat? Nope. That was no treat! Mr. K, why would you fool me like that? And who ever said pumpkin pie was sweet? Yuck! Hehehe! I can't believe you fell for that one, Heather Beather. 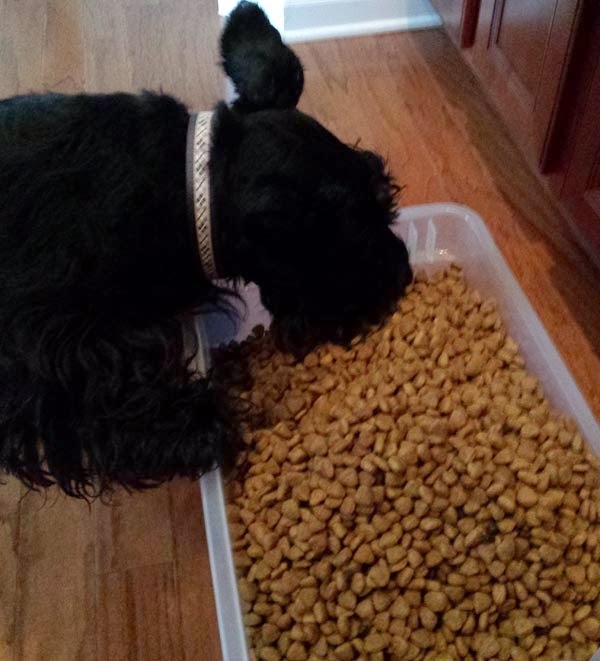 Scottie Mom only gives us the good stuff for treats. I got you good! 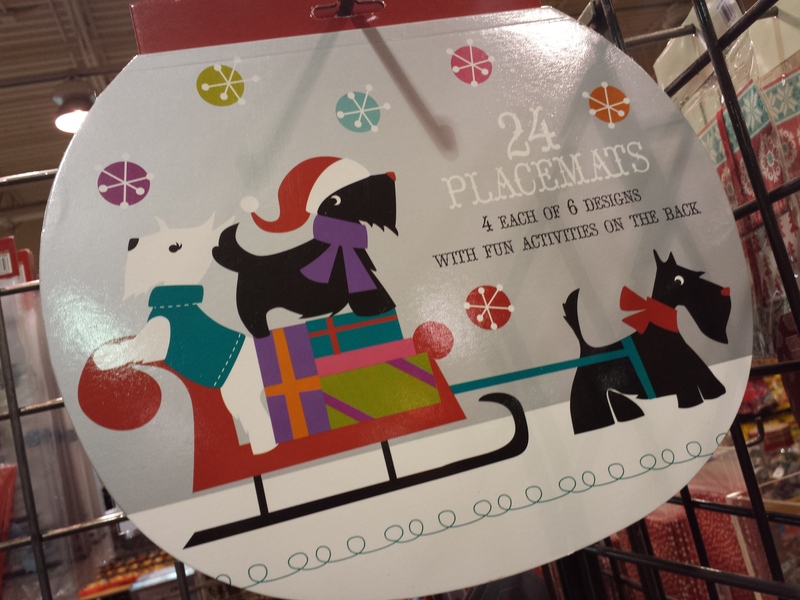 The happiest time of year (the season of Scotties) is just around the corner! 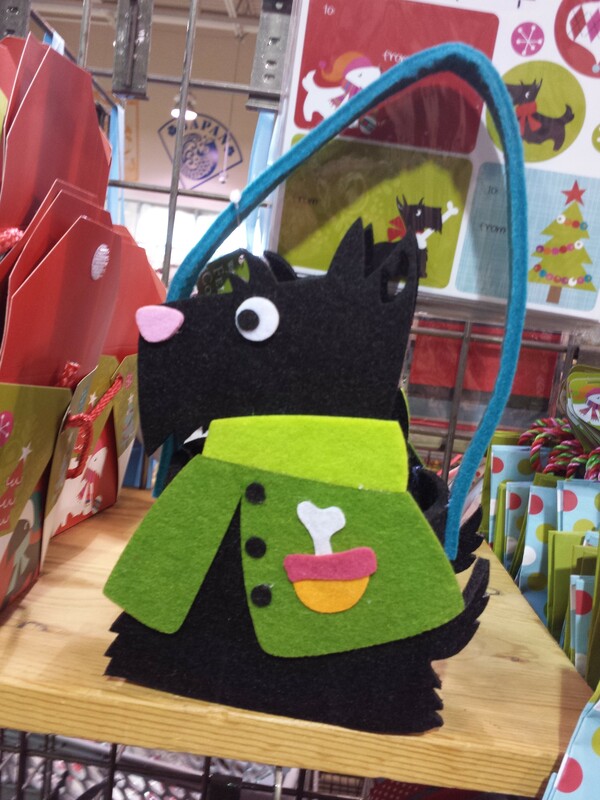 Already, I've noticed a plethora of Scottie items creeping their way onto store shelves. 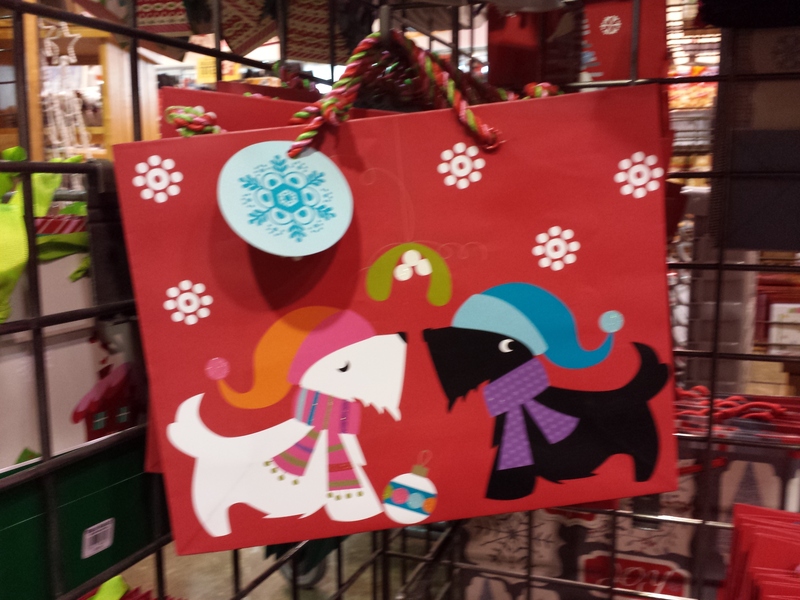 A tip from Pippin Ragsdale led me to World Market to find a whole new line of "Scotty & Friends" products. 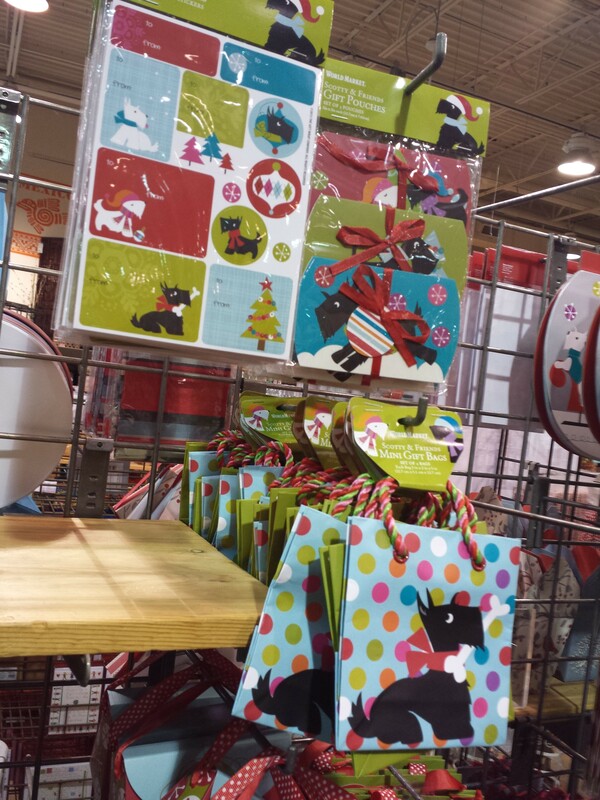 For those of you who shopped at World Market last year, you might remember they had an assortment of items ranging from gift bags, gift tags and clothes pins that Scottie Dad actually used in his very creative Scottie proposal shortly before the holidays last year. 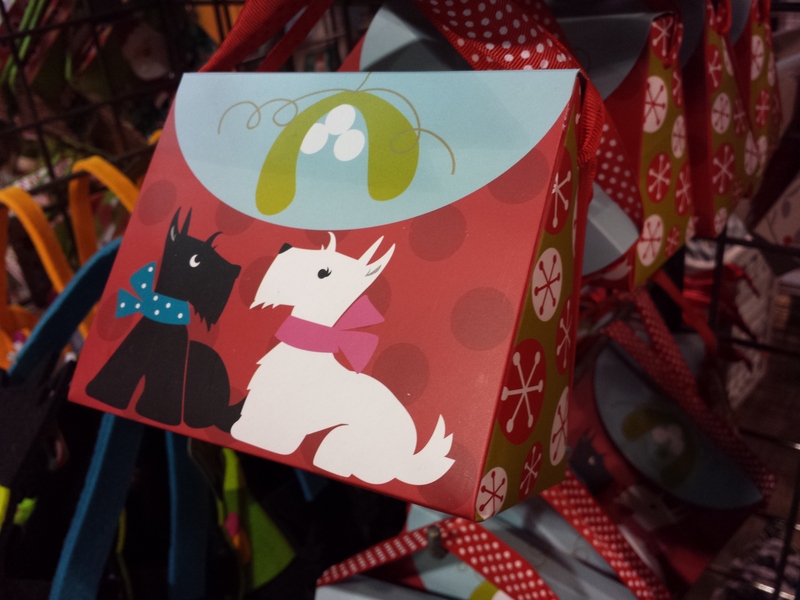 This year, the Scotty & Friends products are back with a vengeance and are cute as can be. 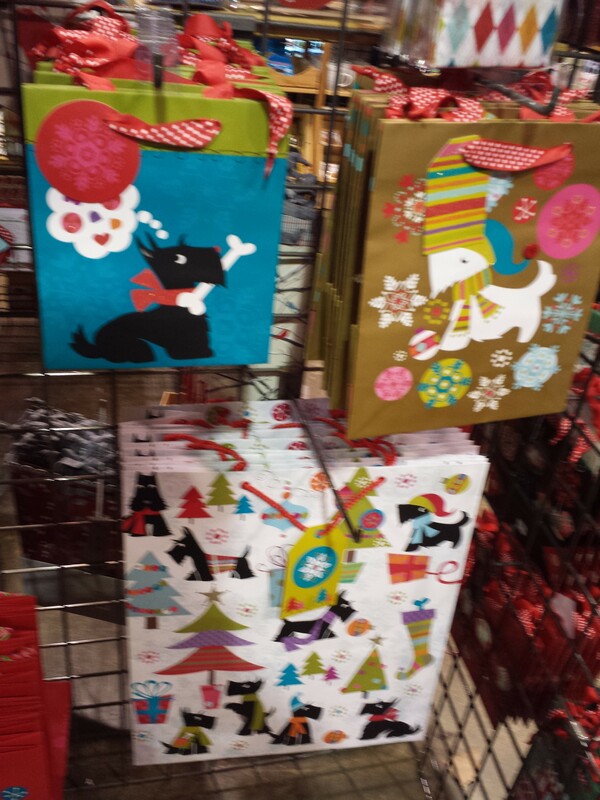 There are various prints of wrapping paper, tissue paper, gift bags and more. 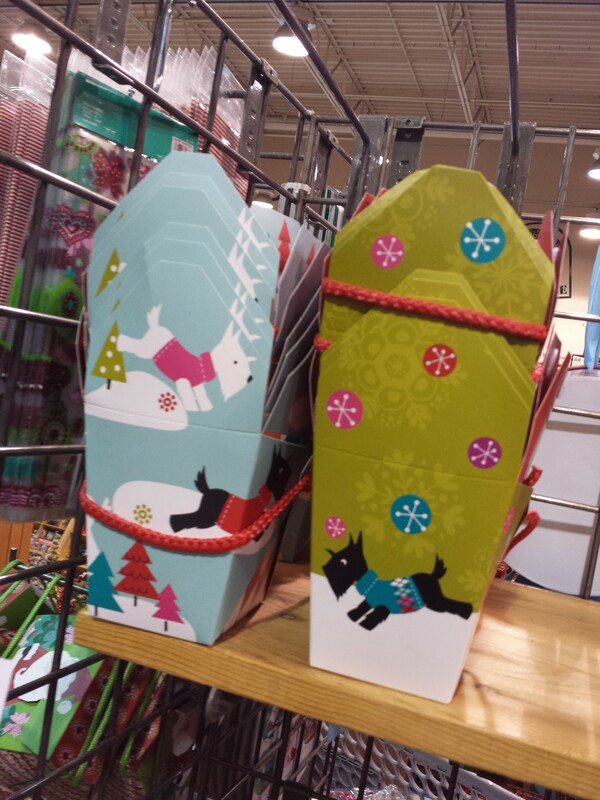 I even saw they had greeting cards! 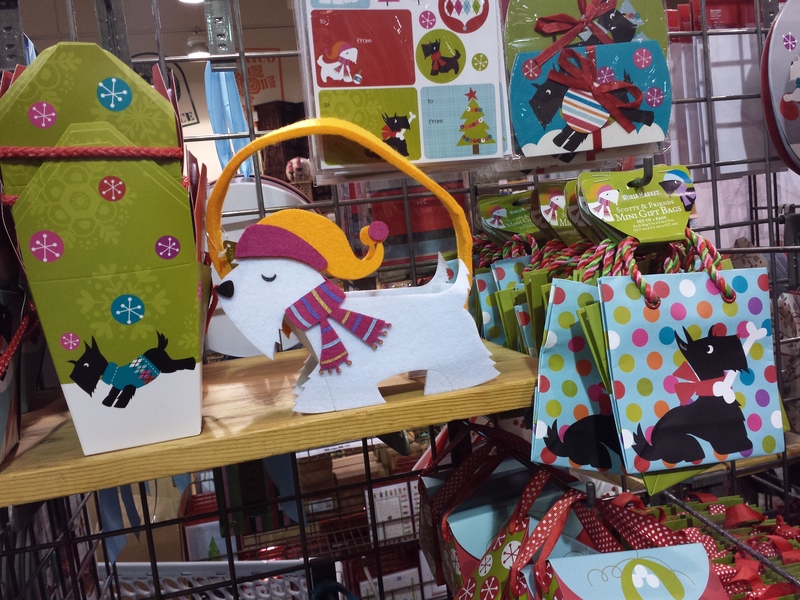 You can see the majority of the collection online here or simply go to World Market's website and search, "Scottie." A word of caution to my fellow Scottie Moms: once you walk into the World Scottie Market trap, it is very hard to walk out without at least one of these items! 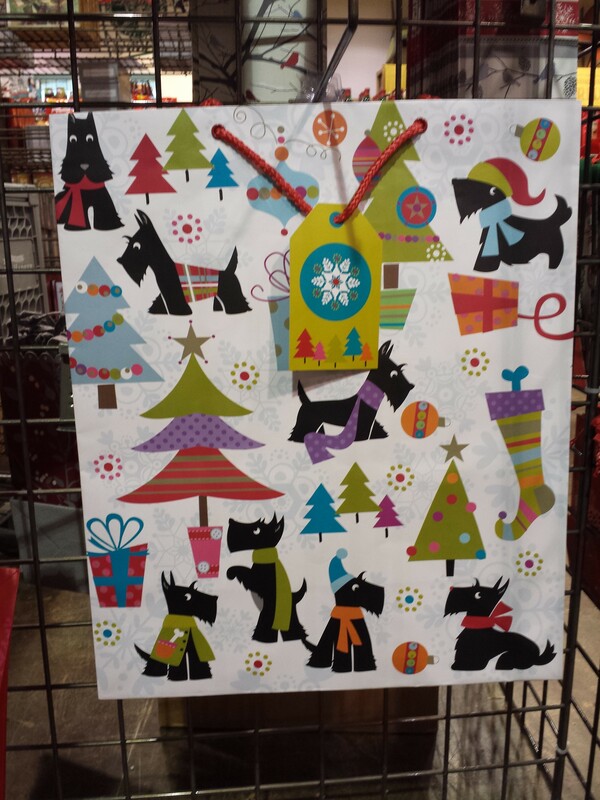 Take it from me, who had no intention of buying anything today - only to report my findings to my fellow Scottie Moms and Dads: I ended up buying nine rolls of wrapping paper that will probably take me nine years to use. Happy shopping, Scottie Moms! Mr. K here. 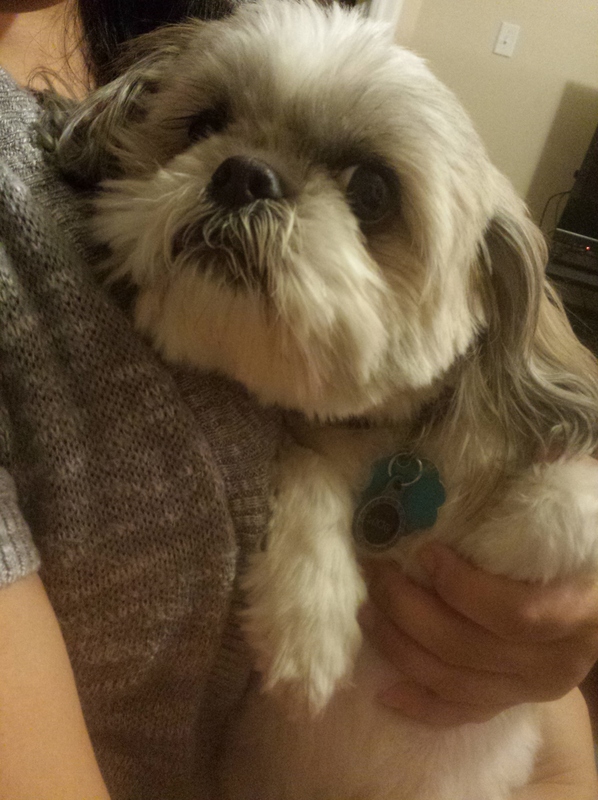 Friends, I'd like to introduce you to the newest member of Scottie Mom's book club: Lucky the Shih Tzu. 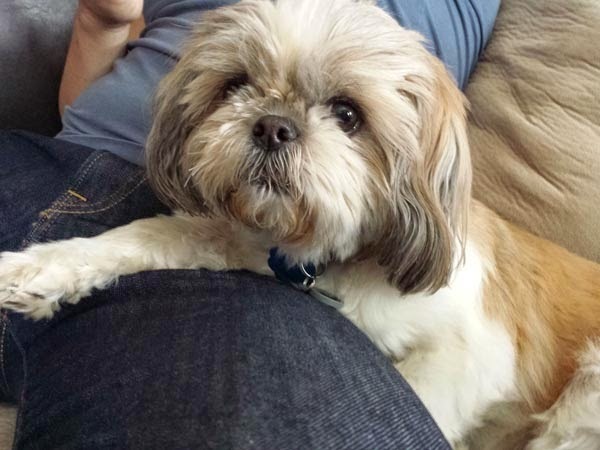 Last week, Lucky came to hang out with us while the group of hoomans chatted over a book and ate some sweet treats we plotted to steal by guilt-tripping everyone into giving us some scraps. For the most part, we were rather unsuccessful but rest assured, we will prevail. The group meets regularly and that means there is plenty of time to brush up on our begging tactics and score some good stuff. (Please feel free to leave your tips for scoring treats in the comment section below!) Besides, you win some. You lose others. Remember that time I scored a quesadilla wedge during the Siete de Mayo book club meeting? That was definitely a win! 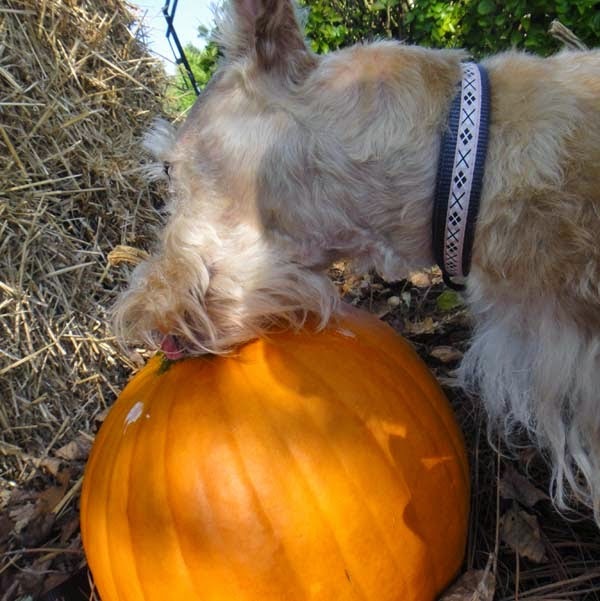 Now, let's hope some of Lucky's good luck charm helps us Scotties continue to get lucky in the treat department! See you soon, pal. It was bound to happen, friends. It was just a matter of time. What we didn't expect, however, was it happening when Scottie Dad was away and when Scottie Grandpadre (another keeper of the keys) was safe and sound in his own home across state lines. Alas, that's what you get for waking Scottie Mom up early on a Sunday morning. There we were, hopping down the stairs on our way for a wonderful walk. Scottie Mom shuffled her way out of bed and followed us down. We jumped (literally for joy) when we saw her pick up the leash and waited patiently as she fastened us to it. We pretty much pulled her out the front door. The air was fresh and cool. We weren't outside for a split second and we knew Scottie Mom had finally woken up. The brisk air put an extra pep in her step for sure. We marched and marched around the blocks and as we drew nearer to The Scottie House, we couldn't wait for breakfast. 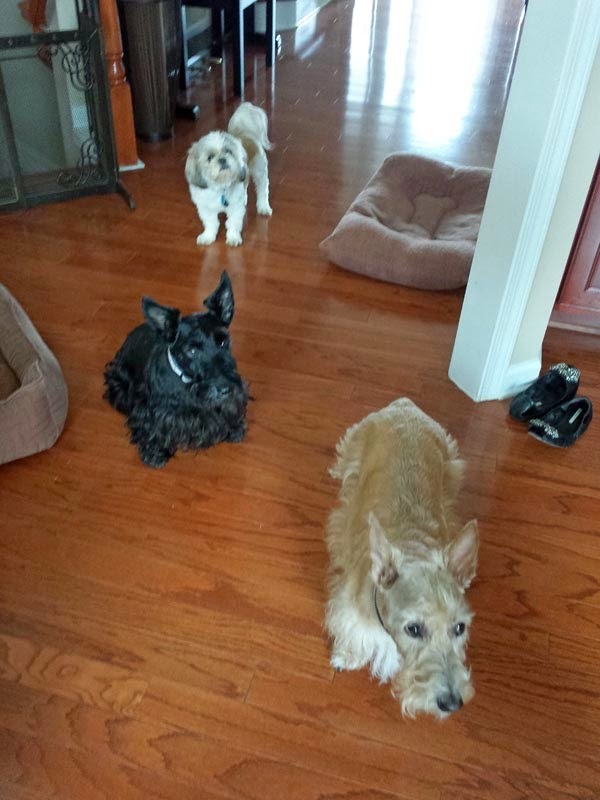 We run up the stairs to the front door and wag our tails excitedly as Scottie Mom makes her way to the door. We do a few more jumps for joy. BREAKFAST! Scottie Mom jiggles the door knob and pushes the door but it doesn't open. Man, she really isn't awake yet. Try again, Scottie Mom. She does...with no luck. 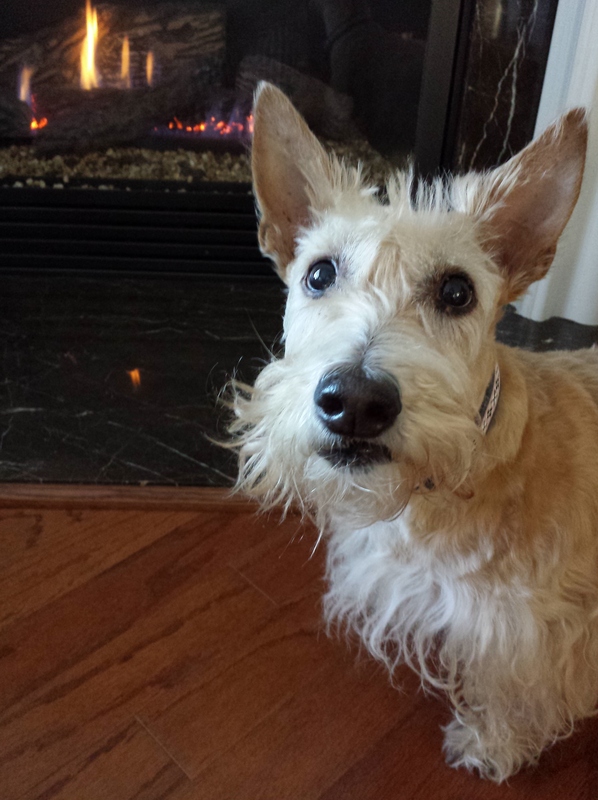 This time, our tails stop wagging and we look up at her as if to say, "What's the issue?" Scottie Mom shakes her head and sits down on the stairs. Where's our food? Why can't we go inside? All of a sudden, we are taking off on another walk around the block. 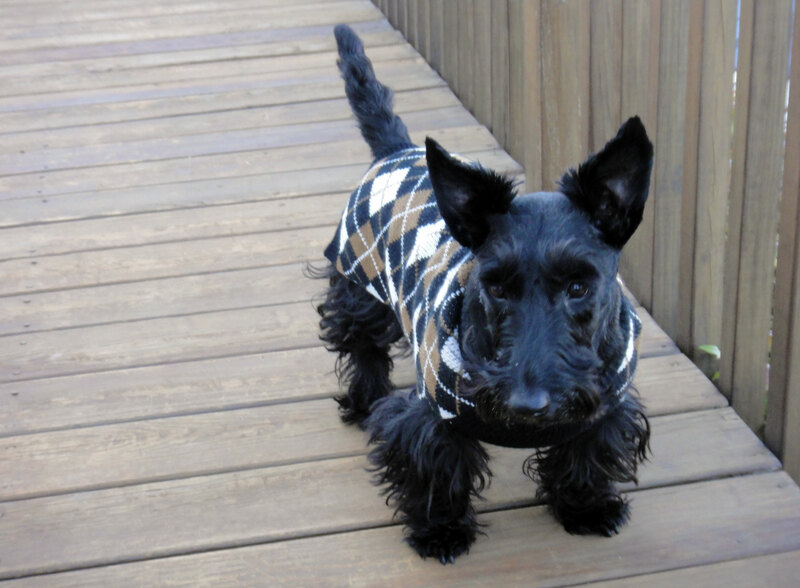 We stop at The Miniature Schnauzer House and Scottie Mom knocks on the door. 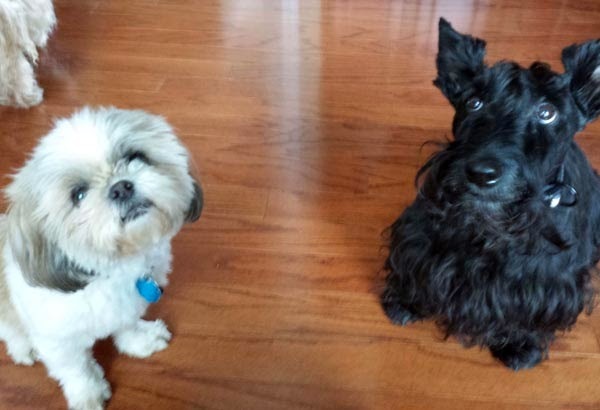 The Miniature Schnauzer Mom and Dad welcome us in and as Scottie Mom borrows their phone, they offer us a comfy bed and some carrots and bananas as treats. 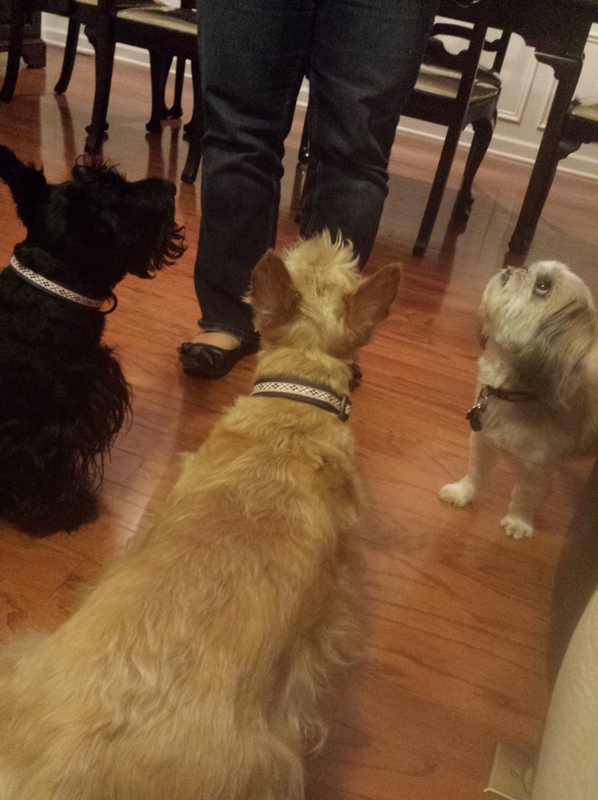 Then, our mini-Schnauzer friends come out to play. We hung out for nearly two hours. While we had fun exploring, we were very concerned about breakfast. Scottie Mom was concerned about being out in public in daylight wearing pajamas. Priorities, Scottie Mom. Priorities. Finally, she gets a phone call on Minature Schnauzer Dad's phone and we go for another walk around the block. 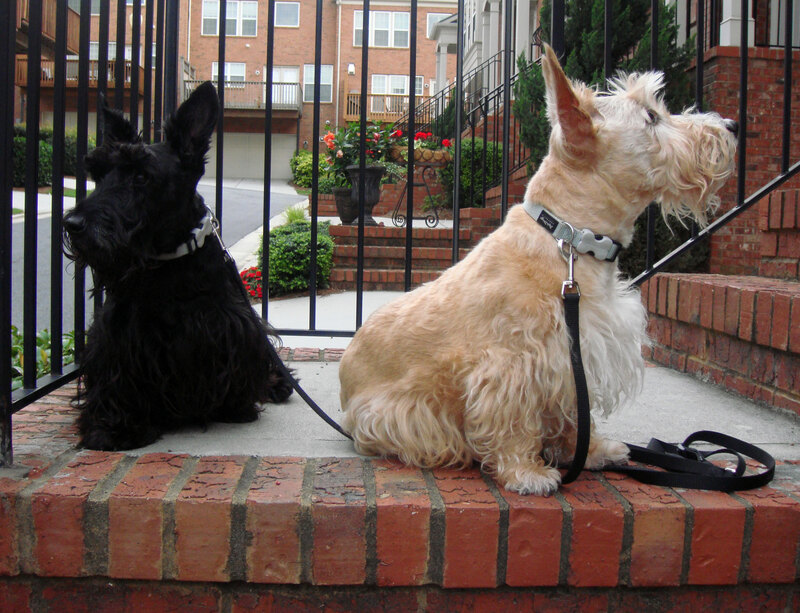 Soon, the Scottie House is in sight again and we bound up the stairs to the front door. Yet, Scottie Mom doesn't go in. What's the deal now? Why can't we go have our long-overdue breakfast? A large van pulls into the driveway and a strange man comes up to the stairs and meets us in front of the door. Surely, we'll go in now. Scottie Mom has a visitor and visitors get invited into The Scottie House, right? The visitor pulls out a few gadgets and starts working the door handle. We don't understand why he opened our door and let Scottie Mom and us in but at this point, we were just glad to be home and out of the cold. Two seconds later, we're gobbling down our food. Scottie Mom is thanking the visitor and gives him an exorbitant amount of money for letting us back in. She escorts him out and we start our usual routine: Heather sitting pretty and Mr. K dashing around the house with toys. All is right again with the world. May there never be another Scottie House Lockout!